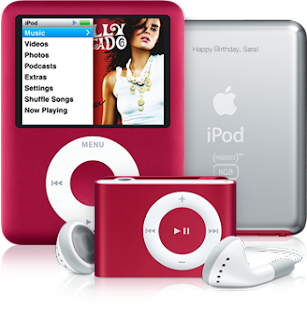 Harley gave me my very first iPod as monthsary gift.. an iPod Nano. I absolutely love it! Aside from being so small, slim and easy to navigate, it's of my favorite color... RED! Now I don't leave the house without it. Okay kasi mag-emote, listening to my iPod (naks I finally have an iPod, sa wakas!) while walking by the river Thames. hehe may bago ng color na magugus2han ni ria =) pink!